Why is Anne so compelling? Why has she inspired such extreme reactions? What did she really even look like?! And perhaps the most provocative questions concern Anne's death more than her life. How could Henry order the execution of a once beloved wife? Drawing on scholarship and popular culture Bordo probes the complexities of one of history's most infamous relationships. In her inimitable, straight-talking style Bordo dares to confront the established histories, stepping off the well-trodden paths of Tudoriana to expertly tease out the human being behind the myths. I've been fascinated with the Tudors since I was a little girl; ever since I learned that Henry VIII had six wives, two of whom he executed, I've wanted to know more about these women who found themselves married to a man who sounded like the worst husband in the world. Once I'd delved into Tudor England, I couldn't break away from it; I became fascinated by the religious turmoil and the turbulence of the dynasty as a whole, from Henry VII's bloody ascension to the throne to Elizabeth I's inspiring but worryingly childless reign. Like many history fans, particularly Tudor fans, I've been interested in Anne Boleyn since I was very young; the woman for whom the King of England would defy the Pope, only to later become the first English Queen to be executed by the very husband who had sought her so lustfully. Everyone has a different opinion of Anne; some people think she was a Protestant martyr while others think she was a home-wrecking whore, not to mention all the opinions that fall inbetween. We're fascinated by her because we're almost completely (in my case entirely) certain that she was innocent of all the charges against her, meaning she was innocently put to death. She was witty and intelligent, and the mother of one of the greatest monarchs England has ever seen. I was recommended this book by a friend of mine, and it sounded like everything I'd ever wanted to read. Rather than a history of Anne's life, The Creation of Anne Boleyn is more about how we perceive Anne; how she's been represented in period dramas and historical fiction and how, ultimately, we'll never know what she was really like because aside from one disputed letter, we have nothing written in her hand. It's worth me pointing out, I think, that if you want a book about Anne's life then these aren't the droids this isn't the book you're looking for. I loved this book so much. As you'll know if you've been following my blog for a while, I've fallen in love with non-fiction this year, and now that I've read this I'd really like to check out more of Susan Bordo's work. The usual problem I have with books about Anne Boleyn is that the people who write them put too much of their opinions into them. I know that might sound odd. Don't get me wrong, I always find other people's opinions interesting, but Anne Boleyn seems to bring out such strong opinions in authors and historians that their books irritate me. For example, I'm not a big fan of Philippa Gregory's portrayal of Anne Boleyn in The Other Boleyn Girl - in fact Bordo discusses Gregory's portrayal as breathing new life into some of the ridiculous insults thrown at Anne, during her lifetime, by rampant Catholic Eustace Chapuys. Though Bordo is a big fan of Anne's, and it's clear from the way she talks about her that she thinks very highly of her, she also doesn't hesitate to point out how much proof certain theories have. Many historians say things must be true because 'they have a hunch', so Bordo's honesty was very refreshing and made me feel like I was reading a book which had been written fairly. It's also written well. I think for a lot of people non-fiction can seem intimidating - I know it did for me. For a long time I didn't think I'd ever be able to read non-fiction for my own enjoyment because I associated non-fiction with sifting through dusty old tomes for relevant evidence to back up the arguments I made in the essays during my student years. This year I finally began to read non-fiction for pleasure and in doing so discovered what I've been missing. 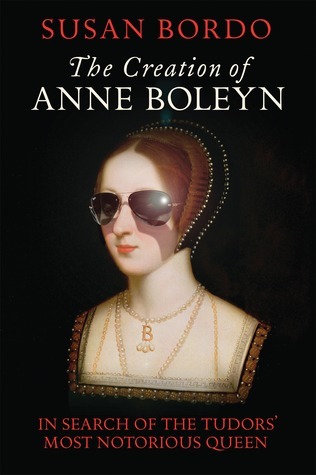 The Creation of Anne Boleyn isn't a dry book at all; Bordo has a very readable writing style, and nothing's ever too complicated to follow. I wouldn't recommend trying to read this if you know nothing about the Tudors - as I said it's not a history book in the traditional sense, so it's not going to teach you the basics - but to be honest I'd be surprised if this book appealed to people who didn't have some knowledge or interest in that period of history. What this book does really well is look at Anne Boleyn as a person - a real living, breathing human being - and her cultural impact. Reading this has also sparked my interest in the French court at this period of history, and particularly in the life of Marguerite de Navarre, whom I definitely want to learn a lot more about in future. If you have any interest in the Tudors, and especially in Anne Boleyn, and you want to read a book about her that doesn't try to figure out whether or not she was guilty for a change, then you need this book in your life.